The district wants to boost kids' confidence and cut down on body shaming. Starting this fall, yoga pants, tube tops and even pajamas are acceptable student attire across the Alameda Unified School District in Alameda, California, a town near San Francisco. The changes came about after students at Lincoln Middle School approached their school’s administration about loosening the dress code. The group of middle schoolers, comprising about half boys and half girls, argued that constant policing of the dress code was disruptive, especially to female students. "The school did not collapse because the girls were allowed to wear spaghetti straps and shorter shorts." Lincoln Middle School agreed to loosen its dress guidelines as a pilot program, and when “the school did not collapse because the girls were allowed to wear spaghetti straps and shorter shorts,” the Board of Education decided to make the policy district wide, Davis said. Now, the district’s dress code focuses as much on what students can wear as what they cannot. The guidelines specifically state that some controversial clothing, including hoodies, sweatpants and athletic attire are allowed. Some types of clothing are still banned, including any items promoting hate, violence or profanity, as well as images or language related to drugs or alcohol. Supporters of the new guidelines hope they will help promote confidence and cut down on body-shaming. Still, some parents have been skeptical of the new policy. But Davis and other district officials reject this argument, calling it outdated. Some families have also argued that the school should have a stricter dress code to prepare students for adult life, when they will have to learn how to dress appropriately at work and other settings. The Alameda Unified School District is one of a growing number of districts around the country that are relaxing their dress codes. Last year, a high school in Evanston, Illinois changed its guidelines to allow leggings, tank tops, spaghetti straps and other previously banned items. Portland Public Schools made a similar change in 2016, based on a set of model dress code guidelines drafted by the Oregon chapter of the National Organization for Women (NOW). The Alameda district also used the NOW guidelines as a template when creating their own, revised dress code. 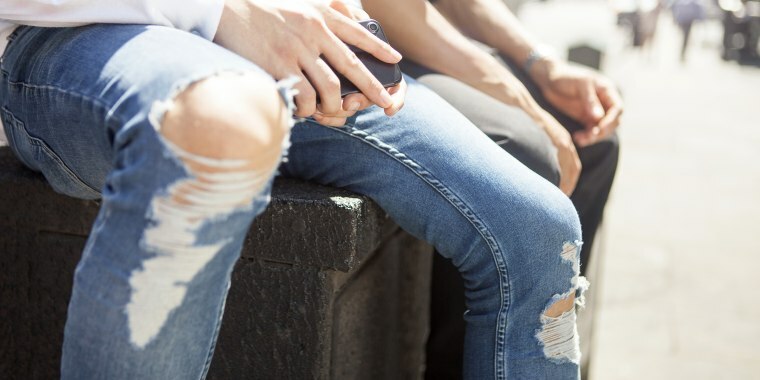 These more relaxed dress codes could have a positive effect on both male and female students, says Shauna Pomerantz, a professor of child and youth studies at Brock University in Ontario, as well as the author of multiple books including "Girls, Style, and School Identities: Dressing the Part". "If we’re constantly telling young girls and young women to cover up, we’re sending messages that their bodies are shameful, ugly, distracting, and illegal," she told TODAY Style. "We’re sending this really harmful message, and we’re sending an equally harmful message to boys and young men about their inability to be respectful to women." She praised the Alameda district's new policy, calling it "revolutionary." "This is a really progressive stance against blaming the victim, criminalizing young men," she said. "I think this is going to have incredible results," she added. "One of the things in this policy is that students should dress in a way that supports a body positive self-image. I’ve never seen that in a dress code before. That to me seems a whole new world of thinking." The new policy in Alameda has been enacted this fall as a pilot program, and the district will be sending surveys to parents, students, teachers and administrators to give them an opportunity to weigh in on the updated guidelines. The school board will review the policy in December and again in May or June of 2019, Davis said, to determine if any changes need to be made. In the meantime, Davis hopes the new policy will help kids feel more relaxed in the classroom, so they can focus on learning. “We just want all of our students to be able to dress comfortably for school and not be worrying about being sent out of class or being embarrassed by some comment about their clothing or their body,” she said.